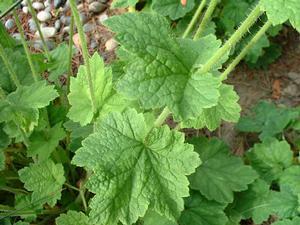 Fringe cups (Tellima grandiflora) is an evergreen perennial. 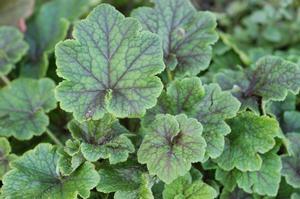 It forms a compact, tidy mound of bright green heart-shaped leaves that often have attractive purple veination. Fringe cups is found in redwood, mixed evergreen and yellow pine forests and along streambanks from coastal British Columbia south into California. 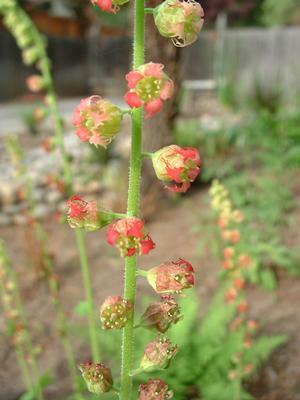 You can grow fringe cups easily from seed. This is the best way if you're wanting lots of plants. Well-established plants can, with care, be divided. Use a sharp knife to separate the clumps. Very little maintenance is needed. Just cut off the flower stems at the base when they've finished flowering. If you don't mind the look of the flower-less stems, you can leave them on till they dry out and then you can pull them out quite easily!